FILE - A Russian cargo ship is seen beneath a bridge connecting the Russian mainland with the Crimean Peninsula after three Ukrainian navy vessels were stopped by Russia from entering the Sea of Azov via the Kerch Strait in the Black Sea, Crimea, Nov. 25, 2018. Recent Western-imposed sanctions targeting Russia — spawned by a naval attack on Ukrainian soldiers on the Sea of Azov late last year — are too little, too late, say former top U.S. emissaries to the region. The United States, in coordination with Canada and the European Union, leveled the sanctions on more than a dozen Russian officials and businesses earlier in March, citing Moscow's "continued aggression in Ukraine." 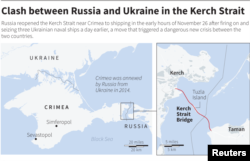 On Nov. 25, 2018, Russian Coast Guard vessels rammed and then seized a trio of Ukrainian naval vessels as they moved across international waters of the Black Sea en route from one Ukrainian port to another. The two dozen Ukrainian sailors aboard those ships have since been jailed in Moscow's notorious Lefortovo prison. FILE - Seized Ukrainian navy vessels are seen anchored in the port of Kerch, in Russia-annexed Crimea, Nov. 26, 2018. "Where were we in March, April, May, June of 2018?" said former U.S. Ambassador Victoria Nuland of the timing of the latest sanctions. Nuland spoke in Washington at a recent roundtable event, titled, "Crimea after Five Years of Russian Occupation." Nuland was one of several former top State Department officials on hand at the roundtable jointly sponsored by U.S. Institute of Peace, the Ukrainian embassy and the Atlantic Council. Nuland, a former assistant secretary of state for European and Eurasian affairs, echoed criticism by retired U.S. Ambassador to Ukraine John Herbst, who was also in attendance. "I know where George was [at that time]," she added, referring to George Kent, the deputy assistant secretary of state for European and Eurasian affairs, who was also at the discussion. "But I don't know where the rest of the administration and the rest of Europe were as the harassment of Ukrainian shipping was beginning, as the first efforts to gain control of that [maritime] territory were beginning. A Ukrainian sailor, right, is escorted by a Russian intelligence officer to a court room in Simferopol, in Russia-annexed Crimea, Nov. 27, 2018. "As has already been said, perhaps we didn't want to see, so we waited until the crisis emerged. And even after the crisis, where were we in trying to increase our presence in the Black Sea?" Nuland said. "We're only just getting there now. Where were we in terms of supporting Ukrainian naval capacity? Where were we in terms of a fast, ready-sanctions reaction?" 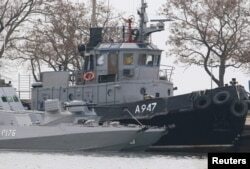 Six Russian officials, six defense firms, and two energy and construction firms were targeted with U.S. sanctions, either over the seizure of Ukrainian vessels in the Kerch Strait, or for their activities in Russian-annexed Crimea or separatist eastern Ukraine, according to a U.S. Treasury statement. Although current and former diplomats all expressed support for the latest sanctions, Herbst said they were still not enough. "Western sanctions were late and weak," Herbst later told VOA's Ukrainian service. "If they'd been late and strong, I'd be celebrating, but they were weak. They sanctioned low-level officials and some Russian maritime-related firms. That's it. They should have done something like sanction some high officials or family members of high officials, and they should have taken a major step like going after Gazprombank, which would've had a real impact on the Russian economy. That would tell [Russian President Vladimir] Putin, 'Don't escalate again, or you're going to get stung.'" Senior Atlantic Council Fellow Anders Aslund largely echoed that sentiment in a Kyiv Post opinion piece. Deputy Assistant Secretary Kent, head of the European and Eurasian Affairs directorate, pushed back on the criticism, pointing out that the U.S. did respond to the Sea of Azov events in real time. "I think we made our response clear, both in immediately calling Secretary [of State Mike] Pompeo and calling President [Petro] Poroshenko the next day — as well as in our public comments condemning the attack and calling for the immediate release of both the ships and the sailors and personnel," Kent told VOA. "And if you recall, while there was a scheduled meeting later that week in Buenos Aires at the G-20, the U.S. and President [Donald] Trump canceled that meeting precisely because of the Russians' refusal to release both the ships and the personnel who were — in violation of international law — seized and then detained," he added. The G-20 group is made up of 20 of the world's biggest economies. Kent said the Trump administration is actively working to change the Kremlin's "cost calculus" for aggression on foreign soil and on international waters. In March 2014, Russia annexed Ukraine's Black Sea peninsula in violation of the norms and standards of the international order. The Kremlin denies this charge, claiming that residents of Crimea voted in a referendum to secede from Ukraine. The majority of the international community has not recognized the validity of the referendum. Russia's modernization efforts in the region include construction of a 19-kilometer (11.8-mile) bridge which opened last year across the Kerch Strait that links the Black Sea and the Sea of Azov. The $3.6 billion project gave Crimea a land link to Russia. Previously, a ferry crossing that was often interrupted by gales served as the only connection. This story originated in VOA's Ukrainian Service. Pete Cobus contributed reporting.